The next day after visiting St Bride Wayzgoose and being overwhelmed by what I saw I had one more day, or to be more precise a half-day, left in London. 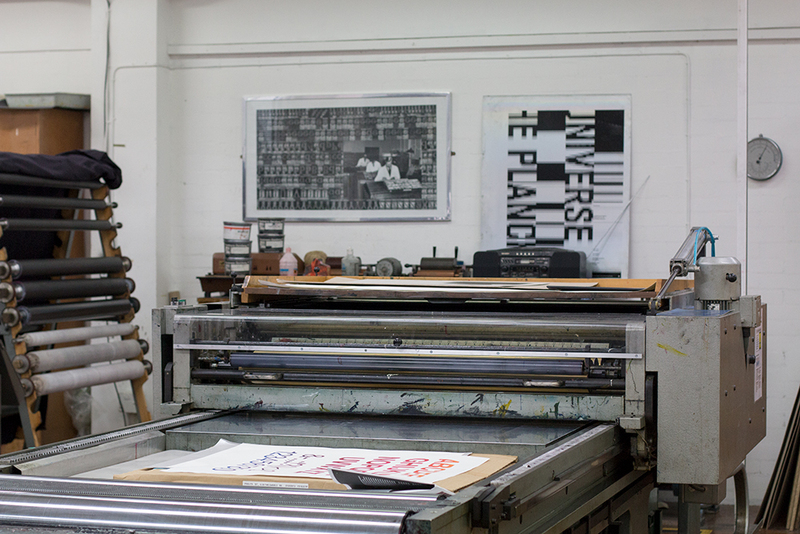 And as my train was leaving only at 18 o'clock I headed to the London College of Communication (LCC) to visit the printmaking department I heard so much about and where Christian Granados, a letterpress technician, was kind enough to make some time free to guide me around. 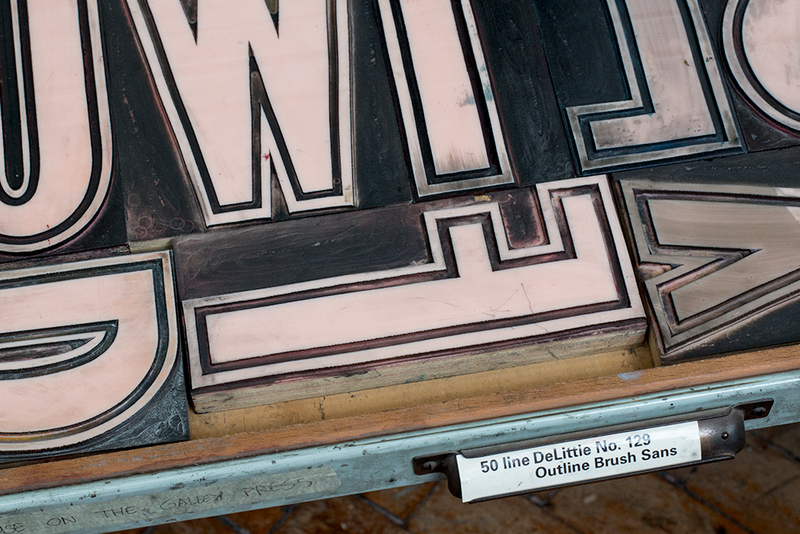 I met Christian during the Letterpress Workers Summit in Milan a few years ago. 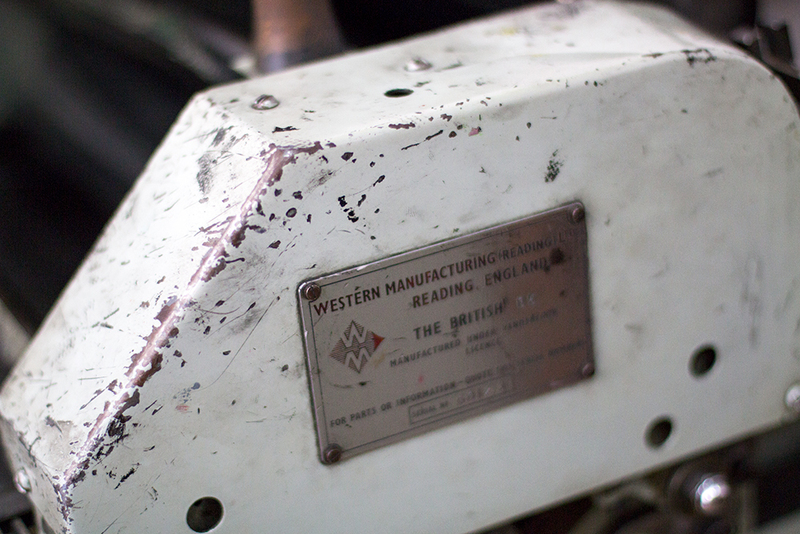 And as with many members of the 'letterpress family' stayed in touch ever since. Originally from Spain, Christian moved to London for his studies where he has graduated from London College of Communication in 2011 with a BA (Hons) Typo/Graphic Design. 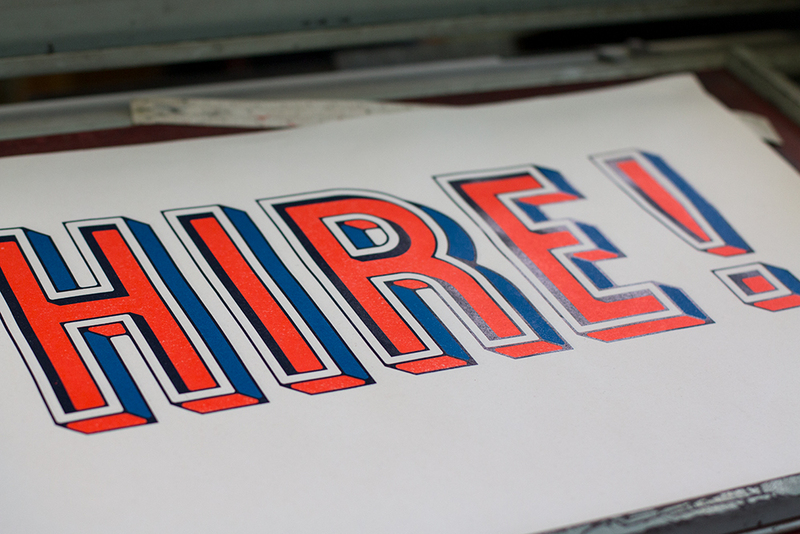 Shortly afterwards he started working as a letterpress technician at LCC. 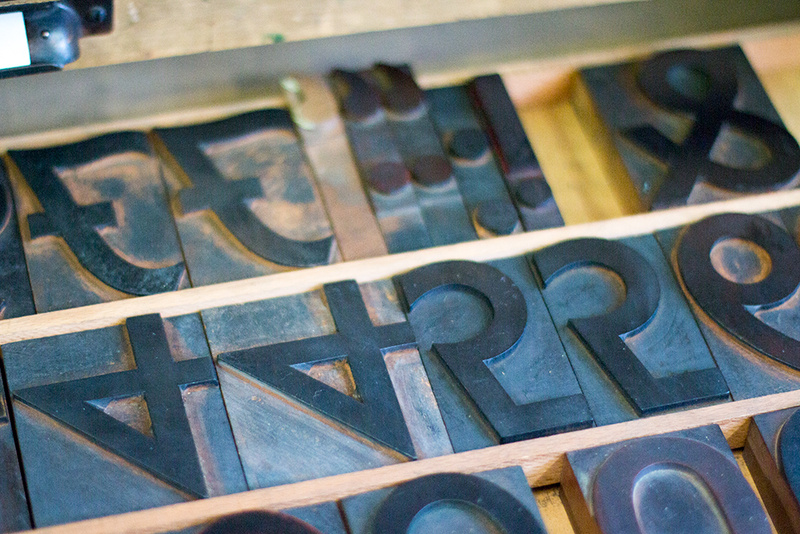 One of Granados’ latest works is his participation in the 6x6: Collaborative Letterpress Project, a student and staff participatory letterpress publication involving six colleges with active letterpress workshops. As well as collaboration with Alan Kitching, where Christian, together with Marta Dos Santos, produced a beautifully balanced, handset and letterpress printed prospectus to announce the Alan Kitching's Concise Letterpress Workshop. 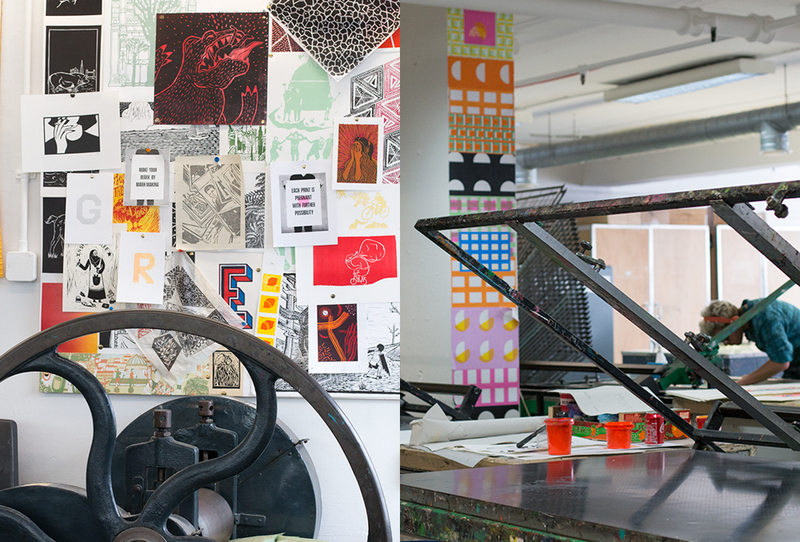 The London College of Communication (LCC), formerly the London School of Printing and Graphic Arts and then London College of Printing, located in Elephant and Castle has an extensive tradition in printmaking. 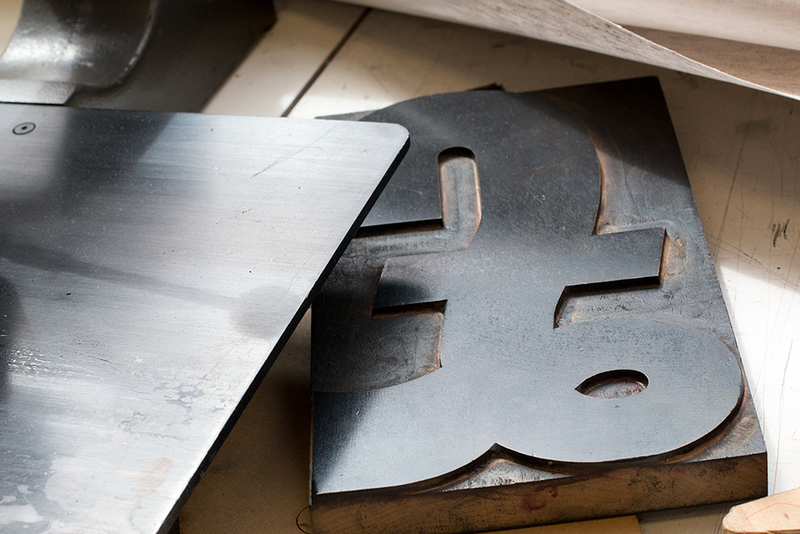 From traditional crafts like letterpress to the latest in digital reprographics or 3D printing. 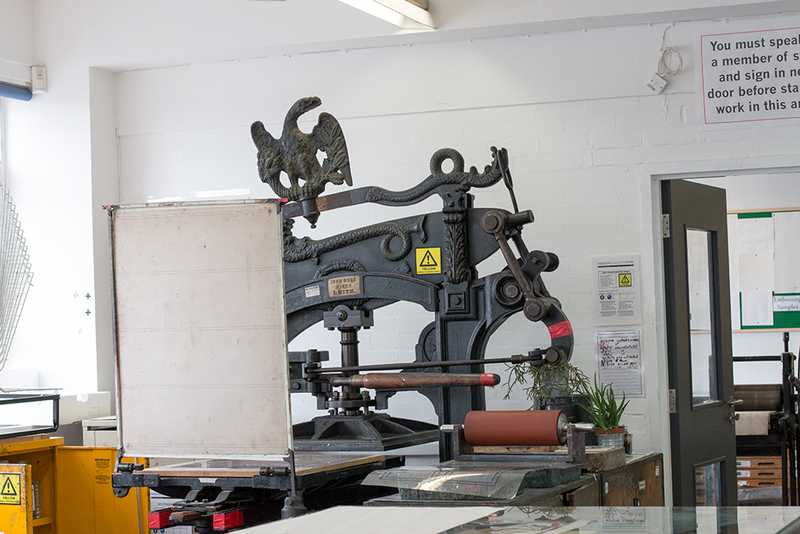 After meeting Christian on the ground floor, receiving a badge at the entrance and passing through several exhibition areas we entered the first of the printmaking room filled with lithography press, Heidelberg and a gigantic offset press. 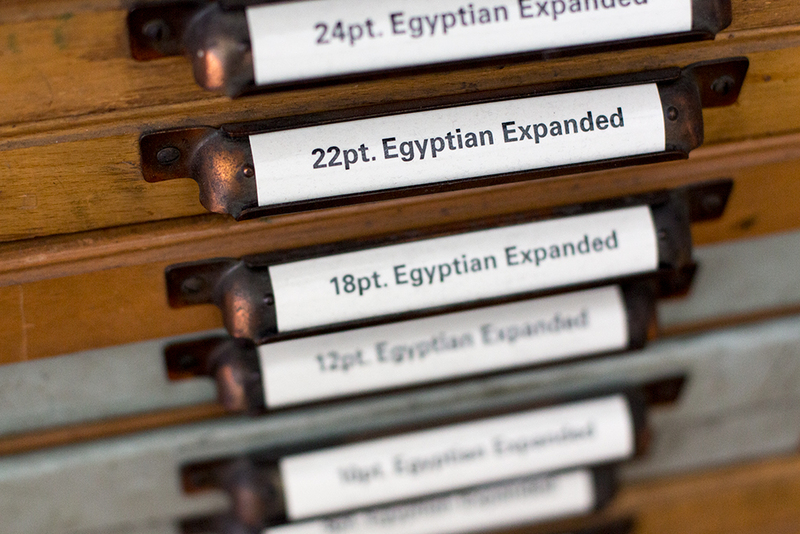 The following room was the actual letterpress workshop, where the rows of FAG printing presses on the right side were accompanied by type cabinets filled with all possible sizes of Gill Sans in wood and metal type, some fancy DeLittle scripts and even modular letterpress P22 Blox. 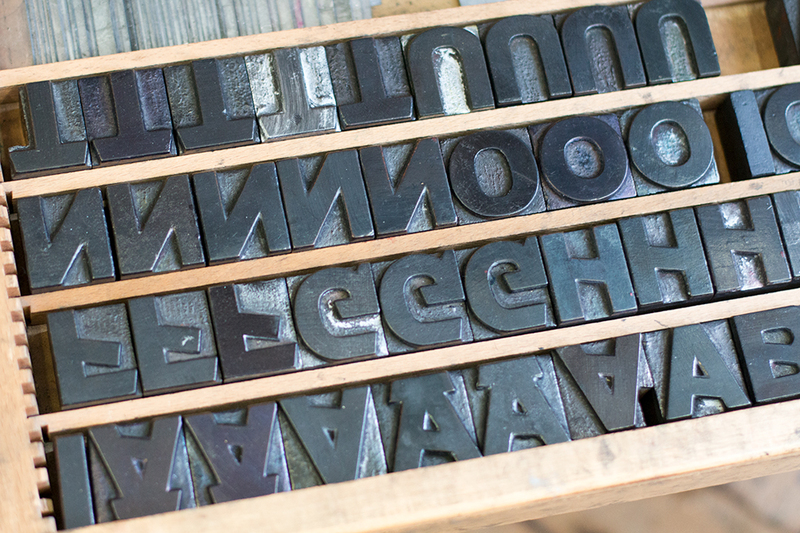 LCC’s letterpress workshop is open to all students, but they do need to take an initial course taught by Christian Granados, what seems like a very good idea to me. 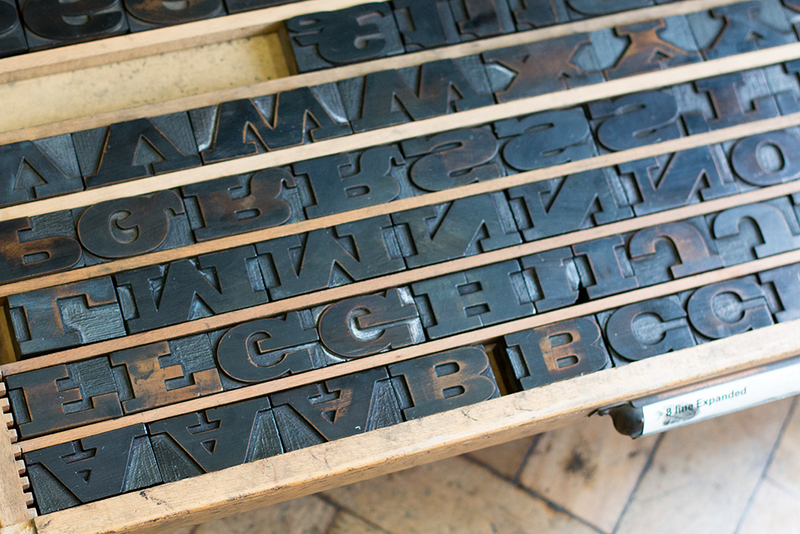 During this 3-day comprehensive course, the students learn to explore the tactile characteristics of wood and metal type, engage with the application of the typographic point system and character-spacing in a non-digital environment. 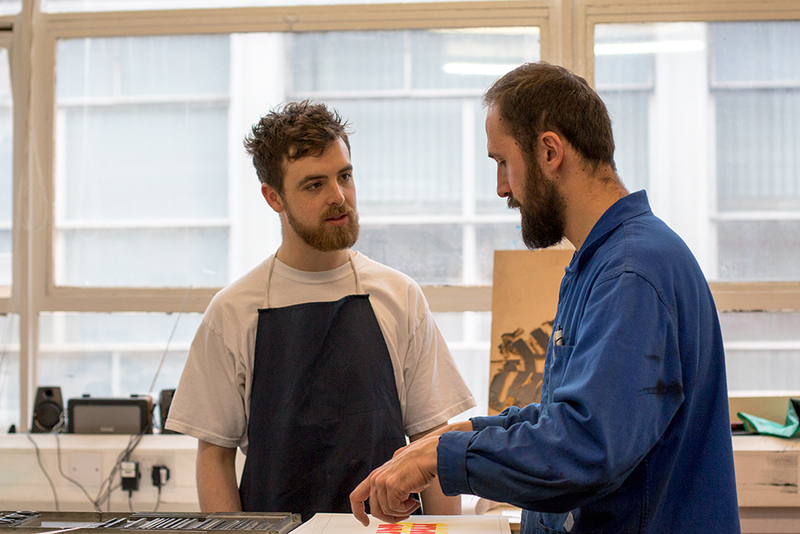 By the end of the course the students are able to design and produce letterpress prints and proceed with their school projects with Christian's help and guidance. 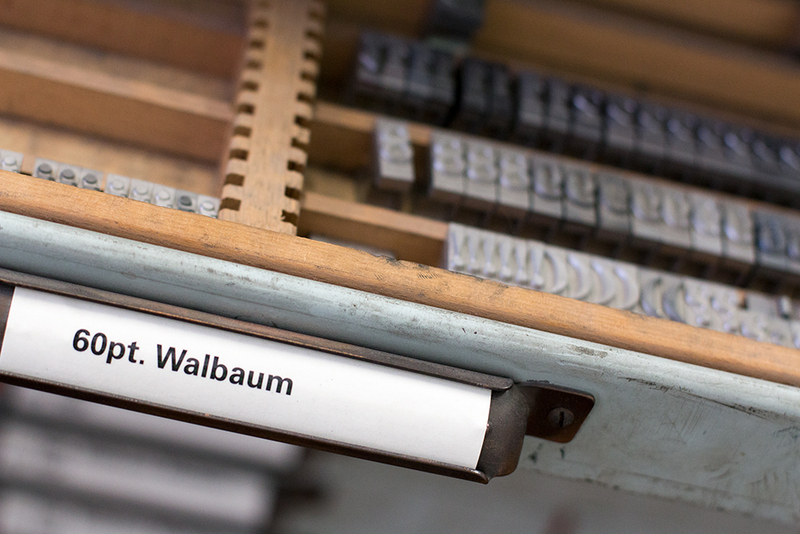 After spending some time in the letterpress area, opening the drawers, looking at English job case layout and some British presses which I 've never seen, I was told by Christian that were more printmaking rooms, so I humbly followed. 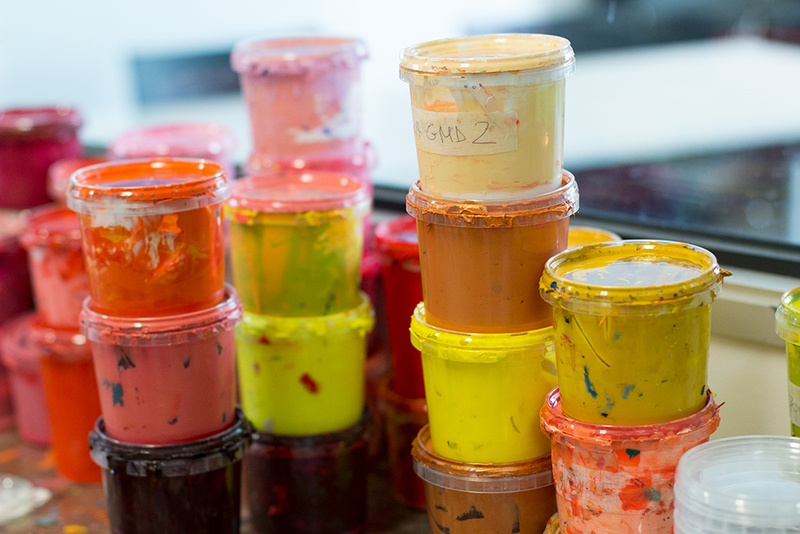 We walked through an extensive silkscreen printing area, divided into 2 parts, for textile designers and illustrators. 3D workshop area where students can work with wood, cardboard and a whole range of plastics using routers, drills, sanding machines and many hand tools to manipulate these materials. 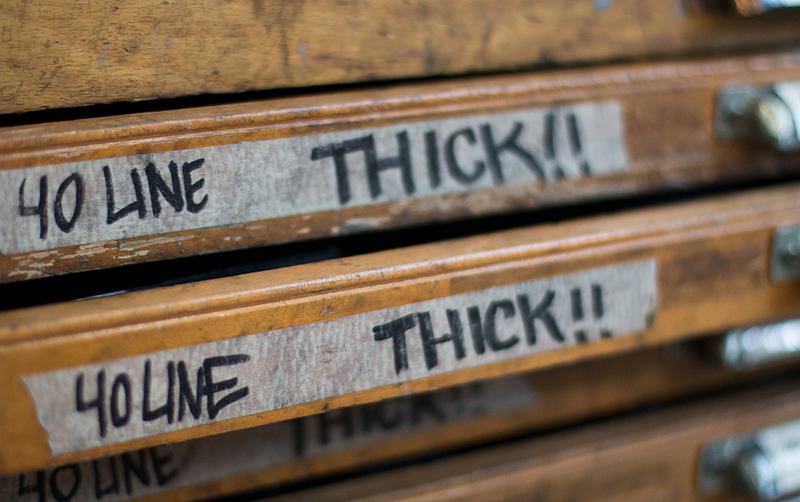 Visited another printmaking area full of litho, etching and hand presses where the students usually produced lino- and woodcuts. 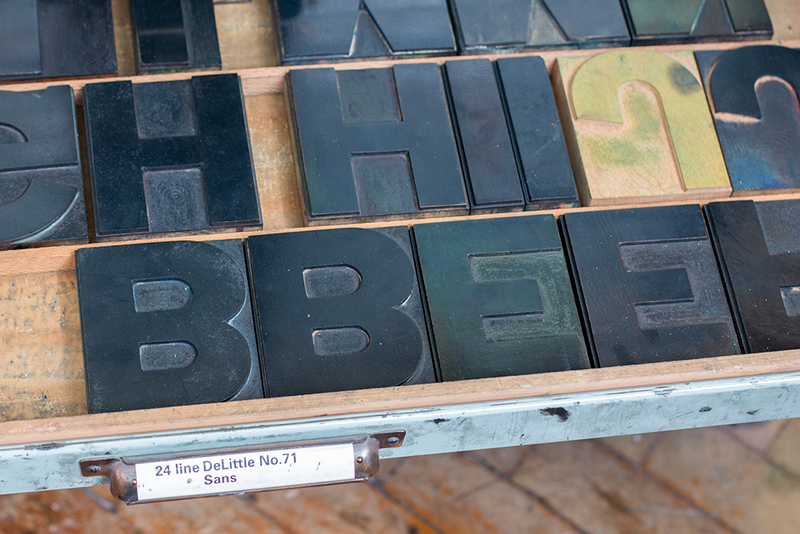 And where a tiny cabinet was provided with some bits and pieces of wood type characters. And arrived at the Book Arts Studio stuffed with an immense quantity of bookbinder equipment (book presses, hot foil presses and so much more). 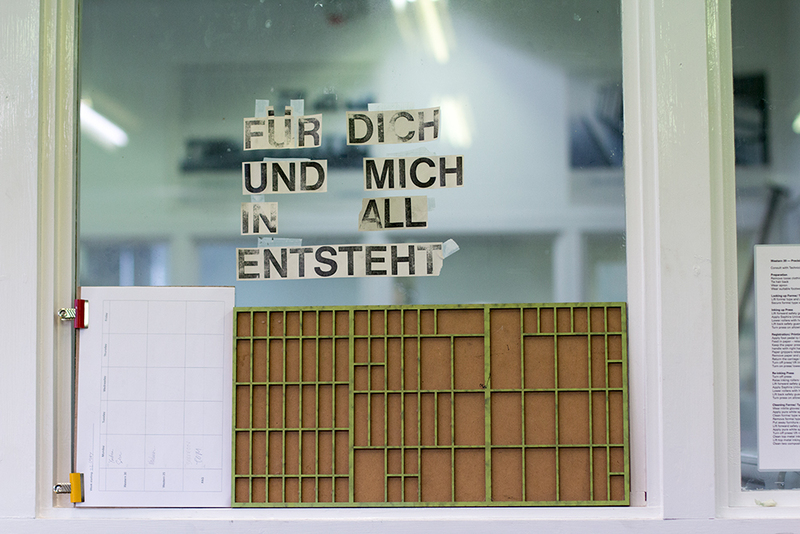 I thought this was one of the gems of the school offering a unique working space where students can combine traditional and contemporary hand bookbinding techniques, adhesive/non-adhesive binding, saddle stitching, debossing, embossing, cutting on the guillotine etc. 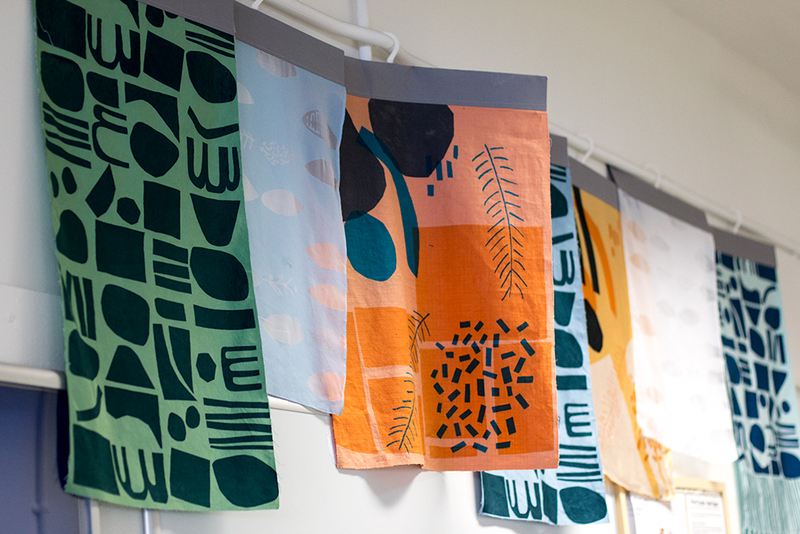 Visiting the printmaking area at LCC, enjoying the creative environment and being inspired by what I saw, this was the perfect end of my London trip. Thank you, Christian for your time, knowledge and enthusiasm!